is a collaboration of two friends, Denise of Singapore Shiok! and Biren of Roti n Rice. Denise and Biren met on the blogosphere in January 2010. They immediately gravitated towards each other because of their shared backgrounds and similar food preferences. Through the many trials of blogging, they supported and encouraged each other and continue to do so till this day. In April 2012, Denise and Biren decided to get together once a month to feature an agreed ingredient, theme, or cooking style on their individual blogs to be published simultaneously. Apart from what is agreed, neither person knows exactly what the other is preparing until the final reveal. This is a fun way for them to further the friendship and to share their culinary heritage. Singapore is home to Denise, a Eurasian (aka Serani) of Portuguese, English, and Asian descent. She grew up with the Kristang cuisine which has its roots in Portuguese-style food infused with local Malay, Chinese, and Indian flavors. Against this rich backdrop, she constantly challenges herself to come up with new and exciting dishes. Biren hails from Malaysia but currently resides in Minnesota, USA. She is a Straits Chinese with Nyonya (aka Peranakan) grandmothers on both sides. Northern Nyonya cuisine with a mix of Chinese, Malay, and Indian dishes were part of her daily fare while growing up at her parents’ home. Even though she lives away from the culture today, she tries to keep it alive by cooking many of those dishes for her family. Both the Kristang and Peranakan cultures have their roots in Malacca and share similarities that resonate through the recipes. 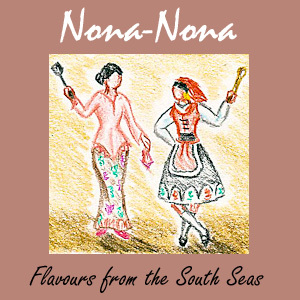 Nona is a Malay honorific word most likely derived from the Portuguese Donha which means lady. Straits Chinese women are called Nyonya, from the same root word which became exclusively associated with them. Nona-Nona is the plural of nona and an apt description for both Denise and Biren.